While enjoying swimming, boating and fishing at Pine Grove Furnace State Park, did you ever wonder why the park even has any lakes? Both bodies of water resulted from the old iron industry, but for very different reasons. Here’s the story of Fuller Lake. Fuller Lake, the smaller of the two park lakes at less than two acres, is the flooded remnant of the primary iron ore quarry or “pit” used by the Iron Works. During the 19th century, it was the most important source of iron ore owned by the company. A 60-foot-long, 18-inch-wide plunger pump struggled to keep the deep hole in the ground empty; even so, major flooding occurred several times. 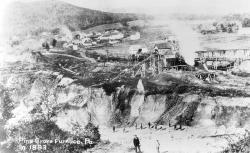 When ore was no longer being mined in the mid-1890s, the pit -- by then 90 feet deep -- was allowed to fill with water for the final time. That depth is why the water feels so cold beneath your feet when swimming at the far end of the roped area adjoining Fuller Beach. 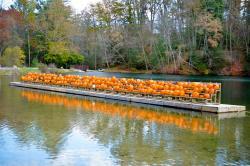 The lake was named for Jackson Fuller, a final co-owner of Pine Grove Furnace when iron making stopped in 1895. In a real sense, he was the last “Ironmaster” at Pine Grove Furnace though that term was not in use at the end of the 19th century. Jackson Fuller died in the Mansion in 1904 and is buried in Philadelphia. Today, people may know that Fuller Lake was once a quarry if only because of the “Legend of the Hairy Hand” -- an event for kids of all ages during the annual Fall Furnace Fest. Although industrial accidents did occur, including at least two deaths at this quarry, it’s not true that a big hairy man drowned while rescuing a slice of pumpkin pie from rapidly rising floodwaters in the pit. (Don’t tell the children!) Come enjoy the annual weekend festival on October 20-21, 2018. The famous Hairy Hand and Pumpkin Float will return Saturday evening. Dr. Andre Weltman is a local historian and is chair of the Friends of Pine Grove Furnace State Park. He often provides guided tours on the history of the park.